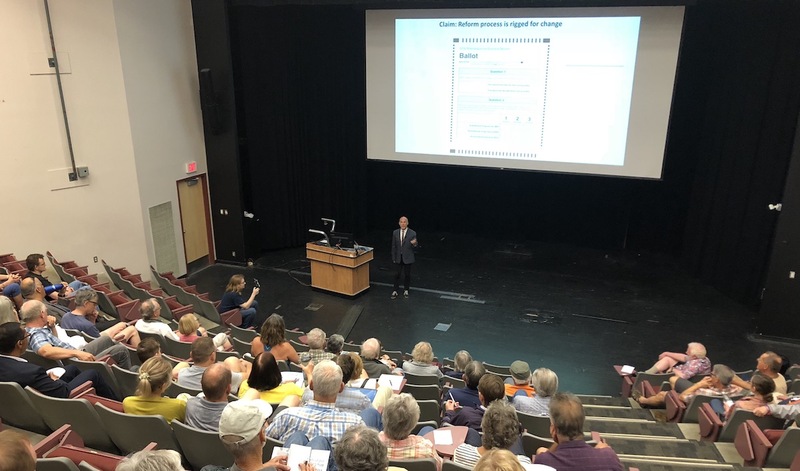 IT WAS GREAT to be in Kamloops again recently and meet with people interested in engaging in a fact-based discussion about voting systems. Conversations like these are crucially important at this time because British Columbians will be voting this fall on whether to keep the province’s current voting system, first-past-the-post, or switch to some form of proportional representation (PR). My talk was meant to advance this discussion by addressing just how well the first-past-the-post and PR sides in this debate are doing in terms of making claims about voting systems. Here’s how I organized the talk. I took claims directly from the websites of groups claiming to support and/or oppose the different systems. My approach was simple: state a particular claim and then examine any relevant evidence to see if the claim could be supported. It is my belief that regardless of where you stand on this issue, you should be prepared to defend your claims, and do so in a fact-based, transparent way so that others can assess whether your claims are sound. On the PR side, I examined claims that a PR voting system would ‘make every vote count,’ more accurately represent the voting strength of different political parties, result in legislative majority governments that also represented a majority of voters, encourage cooperation across political parties, lead to more transparent government decision-making and policy development, and increase the representation of diversity and voter turnout. For supporters of B.C.’s current, first past the post voting system I examined claims that the reform process is rigged in favour of change and against rural voters, that it is rigged to keep the NDP and Greens in power and against alternations in power, that the PR choices that will appear on the ballot are mostly untried and too complicated to use, and that the adoption of PR will lead to political instability, extremism, party dominance, etc. For readers who couldn’t make the talk, you can view the entire powerpoint presentation with the evidence as a PDF here. As readers can see from the slides, fact checking leads to the conclusion that the PR side is generally offering up defensible, fact-based claims while supporters of the current first past the post system are not. I am disappointed that Rothenburger sees things this way. It would appear that he does not believe that people can differ on a matter of public interest in good faith. Of course, it is just this kind of highly partisan, bad faith approach to public debate that my presentation was meant to challenge. Besides, as an academic, I can’t get away with the kind of self-serving approach to research and claims-making that Rothenburger describes because I have to be transparent and systematic in gathering and using evidence. Rothenburger could have engaged with the evidence I provided but instead he just dismissed it with a wave of the hand and ad hominem attacks on my character. And, as I’m sure readers understand, when you attack the person rather than their arguments you’re pretty much admitting you can’t engage the debate on its own terms. If Rothenburger and other supporters of the current first past the post system want their arguments to be taken seriously then they’re going to have to stop slinging mud and start doing their homework, which means making credible, fact-based arguments. For instance, in another column on this subject Rothenburger claimed that coalition and minority governments don’t work. He specifically pointed to B.C.’s ten-year coalition government between provincial Liberals and Conservatives as an example. But most serious analysts of B.C. politics credit the Liberal/Conservative coalition government that was in power from 1941 to 1952 as being very stable, effectively kick-starting the province’s postwar economic expansion and making important investments to open up the economic potential of the interior of the province. And it did last for more than a decade, hardly an indication of instability. When we turn comparative evidence, coalition government is the way that most western countries govern and do so effectively by any of the classic OECD economic and social measures. These are rich and successful countries and they get results – and their governments are made up of multiple parties. Clearly slamming coalition government is not the ‘slam dunk’ argument that Rothenburger and other supporters of the current first past the post system seem to think it is, if facts matter. Of course, I suspect that Rothenburger’s interventions into the voting system debate draw more from his background as a politician than a long-serving newspaper editor. In the worst of politics, the truth doesn’t matter, it only matters what you can get people to believe. So mud slinging and alarmist claims and non-factual assertions are all fair game. Indeed, it is assumed that your opponents are doing the same. Rothenburger correctly notes that I support the shift to a proportional voting system and as such assumes that I will rig my claims to support my objective. But here he has everything backwards. It is my research that has led to me to view proportional voting systems as more in line with Canadian democratic values and practices, not the other way around. Indeed, most political scientists in Canada support proportional voting for just these reasons. We are not pitching for any particular political team or party as a beneficiary of this reform. The point, for us, is to assess what is in the best democratic interest of Canadian voters. Of course, as Rothenburger notes, there are a few Canadian political scientists defending the current system. Here Rothenburger appears to be saying the PR side has experts and the current first past the post side has experts so they cancel each other out. But people shouldn’t take the word of experts just because they are experts, they should examine the actual arguments and facts they are presenting. That is why I went to such lengths to present actual evidence in my presentation. Being an ‘expert’ on this topic doesn’t make me necessarily or automatically right, it just means I am informed about it. In a democratic society, people should investigate what I say, weigh the evidence, and decide for themselves whether my arguments and facts add up. Dennis Pilon is the author of The Politics of Voting: Reforming Canada’s Electoral System (2007) and Wrestling with Democracy: Voting Systems as Politics in the Twentieth Century West (2013). He is also the co-editor of British Columbia Government and Politics with Michael Howlett and Tracy Summerville. He teaches in the Politics Department at York University. Click here to view the slide show for his presentation in Kamloops. Let me throw a small monkey wrench into the frey.There is another form of pro rep that I believe should be added to the question form.Consider the time and effort that is wasted by gov’t on following the party line.ie One person dictating policy to the ledge or commons .ie. the PMO or priemiers office. Many of todays problems would not exist if partisan politics were not involved.Look at what I say.Investigate it and weigh the evidence and decide for yourselves.Then consider non partisan gov’t which is by definition PRO REP.. A little research will go along way. From what I gathered from Dr. Miljan’s link on the Fraser Institute website, her arguments are not in opposition to Dr. Pilon, but rather point out some of the deficiencies in PR voting systems (and there are some because no voting system is perfect). Her argument is that a simple yes/no ballot in the referendum is not sufficient. Dr. Pilon it seems is plugging the positive side of PR voting (and there are many positive aspects). I would say that the best way to get info is to read up on what both of them have to say. Both of these people are knowledgable. 1. No matter how much one tries to be professional, the bias or its perception dominates over any facts. Mel’s response is very representative of what a sceptical citizen would say. 2. Citizens need to hear a clear and consistent message over and over, by different sources, with bias being 100 percent OK in the long run. In other words, yes, a given speaker will be considered biased, but if several speakers repeat and repeat the same message, and if that message is indeed true and fact-based, awareness will arise. To summarize: Dr. Pilon’s talk alone will be perceived as biased. But if ten different likewise “biased” experts all reinforce the facts-based message, the whole will be greater than its parts. Dr. Pilon just needs to be patient and let the story unfold, after which he can take solace in the notion that he has indeed made a difference. Regarding Lydia Miljan, your anti-PR “expert”: The only relationship that she has to a book on electoral reform is that she edited a book of essays for the Fraser Institute (where she is a Senior Fellow). I’ll stick with Dennis Pilon, who has a long list of peer-reviewed academic publications comparing electoral systems and has authored several book on the subject. If we must get into a “my expert is better than your expert” exchange, Lydia Miljan is an Associate Professor of Political Science at the University of Windsor. In addition to peer-reviewed papers, she is the author of three books: Public Policy in Canada, Hidden Agendas: How Journalists Influence the News, and Cross-Media Ownership and Democratic Practice in Canada. Hidden Agendas was short-listed for the Donner Prize for the best book in public policy, 2003/04. Recent research by Dr. Miljan includes “Proportional Representation in Practice: An International Comparison of Ballots and Voting Rules” and “Designing a Referendum Question for British Columbia.” She holds a Ph.D. in Political Science from the University of Calgary, specializing in political communication. Dr. Miljan teaches in the areas of Canadian public policy, research methodology, and politics and the media. But as I said, if you want to equate them, that’s entirely up to you. I hadn’t seen this article before so I thank Mel for his publishing it and presumably airing it on his daily program. Since 2005, when the Citizens’ Assembly studied this subject for so long and quite exhaustively as I gathered from two acquaintances who were on the committee who recommended Single Transferrable Vote (STV) I have been a proponent of Proportional Representation (PR). When I looked into it at that time I realized that every group of citizens across Canada which had studied First-past-the-post (FPTP) vs. Proportional Representation (Pro-Rep) had, without exception, recommended Pro-Rep! The Law Commission of Canada in a two year long study of electoral reform tabled in the House of Commons in March 2004 advised replacing FPTP with Pro-Rep (www.fairvote.ca). Dr. Pilon is far from the first to study this issue. I, too, went to Dr. Pilon’s presentation, and found his evidence as persuasive as that which convinced our 2005 Citizen’s Assembly. And I agree with his closing statement, “In a democratic society, people should investigate what I say, weigh the evidence, and decide for themselves whether my arguments and facts add up. But I can also see why Mel might interpret some of Dr. Pilon’s article above as being an attack on his character. That is unfortunate, because I don’t think the Dr. intended it that way.